STRUMIS LTD was pleased to be invited to participate in the Tekla Managers and Users day in Dubai, UAE on 25th January 2012. "We were delighted to be invited to sponsor this prestigious event further to our recent partnership agreement with Tekla", commented Sales Manager for STRUMIS LTD, Mr Steve Watson. "STRUMIS are excited to work with Tekla Middle East and to support our new cooperation" he added. 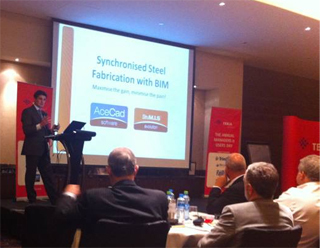 STRUMIS LTD presented at the Tekla Managers and Users Day, on ’Synchronized Steel Fabrication with BIM’. This session for structural steel fabricators featured how with STRUMIS steel fabricators save time, materials and money through greater efficiencies - increased competitive advantages, profitability and process traceability. We also exhibited at the event and enjoyed speaking to all Structural Steel Fabricators throughout the day. If you would like to reserve a meeting with a STRUMIS LTD technical specialist to discuss your particular structural steel fabrication processes please contact us here.